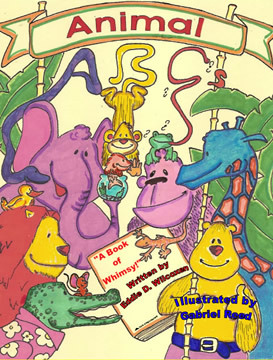 Animal ABCs is my first children's book, or more accurately, my first parent and child book, or grandparent and child book. This is a "sit them on your lap and read to the little ones" book. During the year or so it took to finish this project, I got the opportunity to do just that several times, with a number of different "experimental" kids! I am happy to say that on each occasion the book passed with flying colors. For that I am extremely grateful to Gabe Reed and his terrific, whimsical, illustrations! This is the first time I've done a collaborative effort, and although it's a little more effort to synchronize two brains and visions, it was well worth it. Gabe brought an artistic touch and a light hearted approach that I know you will enjoy! I was amazed that when I shared the "coloring book" idea, some parents told me that their very young children would "ruin" the pictures. My view is that whatever they do, they can't "ruin" the pictures, just so long as they enjoy putting crayons to paper! My recommendation is that you name and date each coloring effort, no matter how rudimentary. That way, it's always "right," and a memory and a laugh to share of an earlier stage of their development! Here's hoping that ANIMAL ABCs leads to some special times, and captures in your mind memories of when they were young, and in theirs, visions of the wonders of childhood.